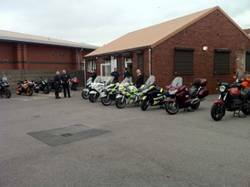 The National Bikesafe Course is a motorcycle rider skills assessment process that has been tailored to suit motorcyclists of all skills and ages. From relatively new riders or those who have years of experience, Bikesafe has something for you. Perhaps you have identified areas in your skills of machine handling that may be improved or you want to see how others 'do it'. The awareness of the need for improvements in standards of motorcycle riding is often identified by the individual rider or may be observed by a friend. Some riders may be reluctant to take the step in taking the assessment for a variety of reasons. Just think of this phrase 'You don't know what you don't know' and if you don't, you will always wonder what experience you may have missed out on. Followed by an afternoon of practical rider assessment. The course one day in duration and is held at Weekends. It is subsidised by the Welsh Government and is currently available FREE of charge for NPT residents.The course is also available to any riders from other areas who wish to apply at a cost of £55.00. It delivers six hours of engagement to each rider. There is an informal classroom atmosphere in the morning and a ride out after lunch of up to 100 miles on a wide variety of road types. Up to twelve riders attend each course and light lunch is (provided) It is supplemented by the attendance of external Approved Assessors for the practical element on a 1:2 basis. The course and feedback input will benefit riders in terms of knowledge and understanding and will help improve skills in awareness, planning all round confidence in handling their machine. All riders who have been on the Bikesafe experience have commented that what they have learned has already made a difference and has assisted them to ride more confidently safely.